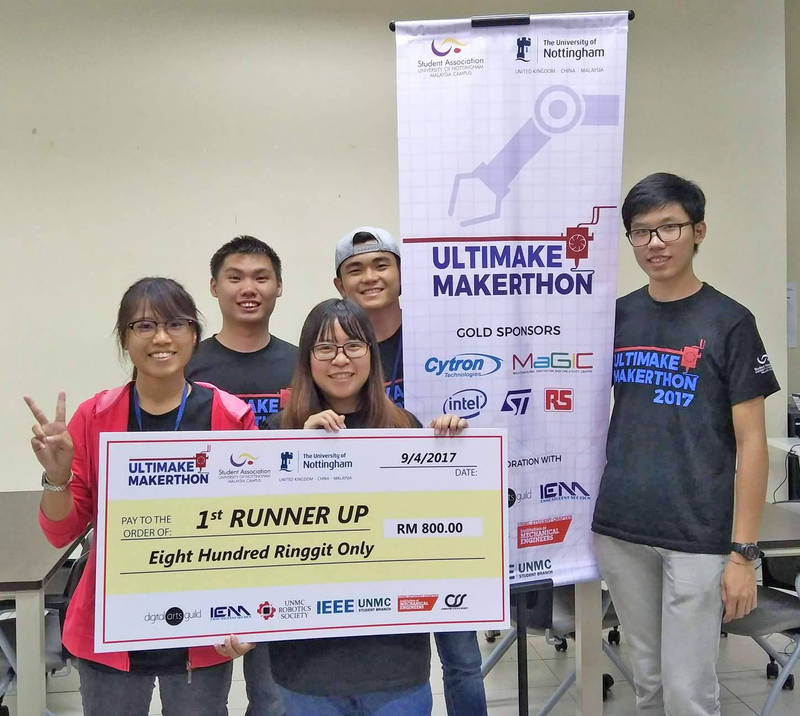 It was a proud moment for a team of five UTAR students to emerge as first runner-up in the Nottingham University Robot Competition (NURC) “UltiMake Makerthon 2017”, an annual international robot competition held at The University of Nottingham Malaysia Campus in Selangor from 8 to 9 April 2017. The team comprised of Electronic Engineering students Tan Boon Kai, Chew Jia Ching, Eileen Tan Mei Foong, and Foo Kian Sang from the Faculty of Engineering and Green Technology (FEGT); and Computer Science student Lim Yun Kai from the Faculty of Information and Communication Technology (FICT). The team members walked away with a cash prize worth RM800, three silver medals and three Raspberry Pi Model 3Bs, a credit-card sized computer that is plugged into a television and a keyboard to imitate the similar use of a desktop PC. Themed ‘Solution for the Underprivileged’, the NURC “UltiMake Makerthon 2017” is a 24-hour hackathon for university students to foster creative ideas using currently available analogue and digital tools to build products that would benefit the underprivileged society such as the elderlies and the disabled. It was also aimed to encourage university students to bring inspiring ideas into reality and rapidly produce a working prototype to solve real life issues. The team won second prize for their project titled, “Eye-tracking Mobility for Locked-in Syndrome”. The team’s prototype was a concept build on a moving platform that carries locked-in syndrome (LIS) patient on it and it is controlled by the iris coordination. LIS is a rare neurological disorder in which a patient is completely aware of oneself, but unable to move or communicate verbally due to complete paralysis of nearly all the voluntary muscles in the body except for vertical eye movements and blinking. “The prototype was designed using an Arduino microcontroller with serial communication and laptops through Bluetooth and local network. A goggle was made using a near infrared camera modified from a webcam mounted on it, detecting the iris movement and coordination. It was connected to a laptop for image processing, before the command to move the moving platform was sent to the microcontroller via Bluetooth. The microcontroller then receives the signal from the laptop and it executes its movement,” said the team leader, Tan. “I’m glad that I could participate in the competition and in the end the hard work paid off. I hope there is more competition like this organised in universities. It’s a great platform for us to interact and compete with teams from various universities and at the same time gained new knowledge through discussions. We felt great and proud when we successfully implemented the project idea and we hope we will be exposed to more chances in order to implement our ideas in the future,” said Lim, the participant from FICT. The Nottingham University Robot Competition (NURC) “UltiMake Makerthon 2017” was organised by The University of Nottingham Malaysia Campus and it has been held for four consecutive years since its first introduction in 2014.